Last winter we took a long weekend to spend a night at the Ice Hotel just north of Québec City. The rest of the weekend was spent walking around exploring and rediscovering the beauty of Old Québec. At the bottom of the cliffs under the watchful eye of the majestic Chateau Frontenac lies the section of the old city called Lower Town. 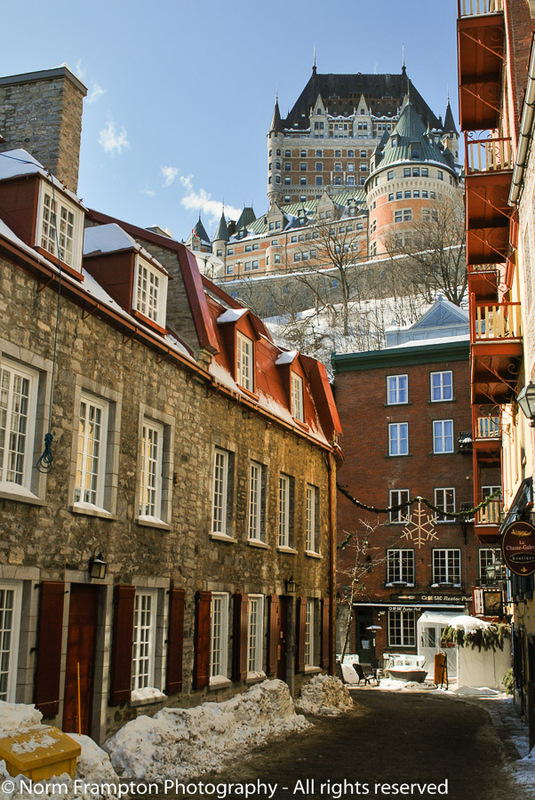 Aside from the Chateau Frontenac which is often referred to as the most photographed hotel in the world, Upper Town also has some wonderful old buildings and several historically significant churches. But for my money, with it’s narrow winding streets and so many well preserved old stone buildings still in use as shops and inns, boutiques and restaurants, Lower Town is the most charming place to visit – especially in winter. 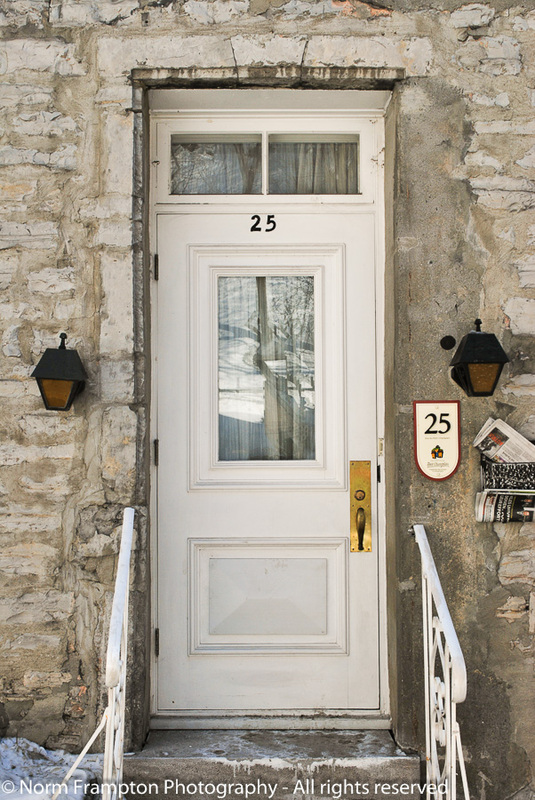 Gallery | This entry was posted in Photography, Thursday Doors and tagged Blogging, Canada, Doors, Photography, Québec, Quebec City, Thursday Doors, Vieux Quebec. Bookmark the permalink. Oh oh…I see it is too late. I’ll send a link next week. 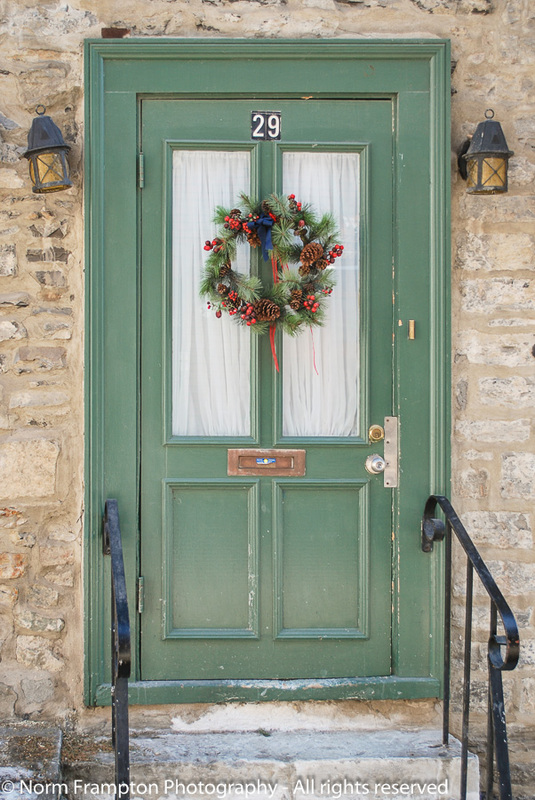 Here is my Thursday Doors Challenge entry for Dec. 3, Norm. Mexico loves to go further than the norm, but this house was actually built by a gringo! A famous one if the neighbor is to be believed. I need to do further research. I agree, it is a special place. As for the Ice Hotel you can visit and do the tour or the day for about $20.00 – you don’t have to spend the night unless you want. Oh, I didn’t know that. Thanks. Looks like a wonderful place to meander in. Thanks. Yes I’m almost ready for some snow here, we haven’ t needed our boots yet – soon enough I guess. Yes and Michelle’s link (Nato) isn’t working at all. Will fix them when I get home later this evening, thanks for the reminder. charming! wonderful ‘upside down’ view (upwards towards that beautiful castle). Wow, wow, wow – you have outdone yourself! So many beautiful doors, and that first shot is just stunning! Wow – I’ve never been to Quebec. Looks like I’ve really been missing out! Yes it really is a special place. Less than a 3-hour drive from Montreal so lots of tourists do both on one vacation. A great collection Norm and I love the first two photos very much. Quebec in winter looks wonderful! And cold. 🙂 I’d love to experience it myself! Thanks for sharing such lovely doors! Thanks. I hope you get the chance to experience it too. As long as you dress for the weather, you won’t regret it. The last door #35 is my favourite! What a wonderful little door. … and I agree that your photo from Lower Town of the Chateau is one of the best I’ve ever seen. Simply beautiful. That’s very kind of you to say Joanne; thank you. We’re really lucky to have special places like this so close to home. We stopped in the Chateau Montebello on the way to Ottawa this summer and I just sat there in awe, admiring for over an hour. We had somewhere else to be, but I just didn’t want to leave! Your Chateau photo is awesome Norm! Love the angle you shot it from. 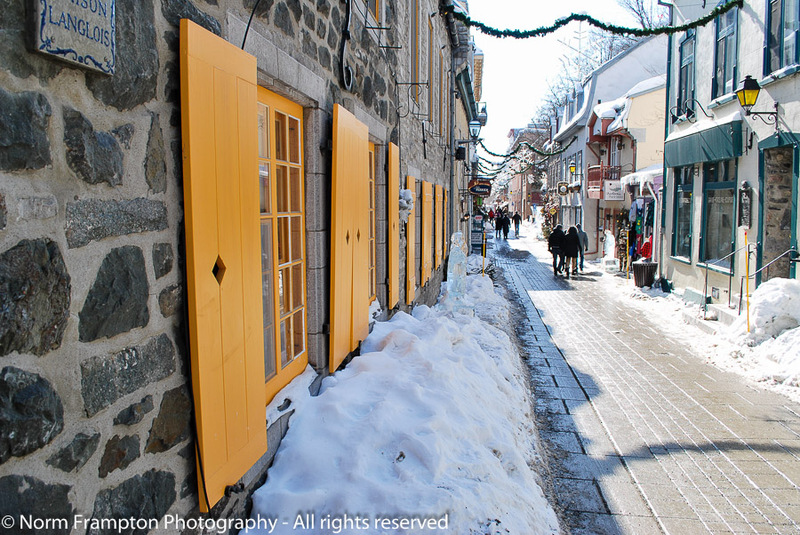 Quebec City is such a fantastic place to visit, winter or summer! It is indeed, thanks so much for the kind words! What wonderful buildings, doors and all! I especially love the one deep-set in the thick stone wall; it looks so cozy. Thank you for tour! I so want to go back to Quebec, but in the winter. I want to ice skate there, too. No ice skating in August, lol! Look how stunning. *sigh* You’re so lucky to live there. Thanks. Lucky indeed, but it seems no matter where we live we all kinda take it for granted after a while. After Rio and New Orleans, it’s the 3rd biggest Lent festival in the world and I’ve NEVER been! We might have to fix that this winter. Norm, what a great gallery! 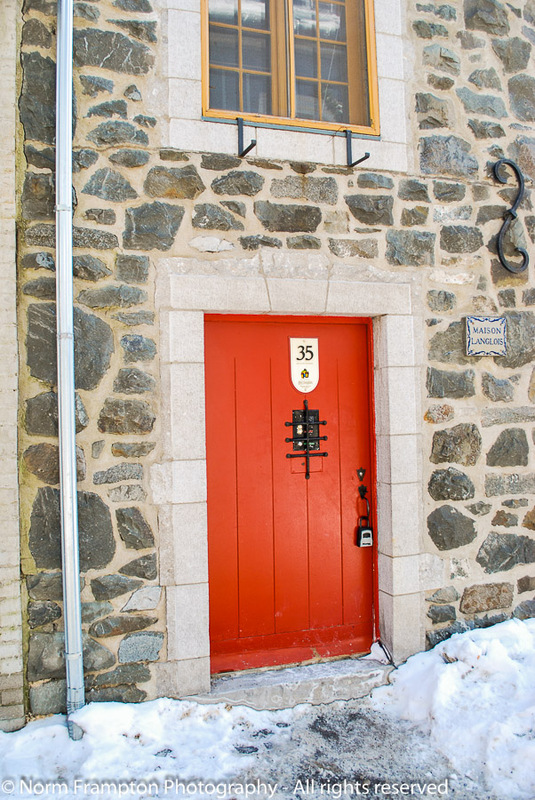 We went to Quebec as the final stop on our honeymoon inn 1984 and you’ve now engendered a desire to revisit it. 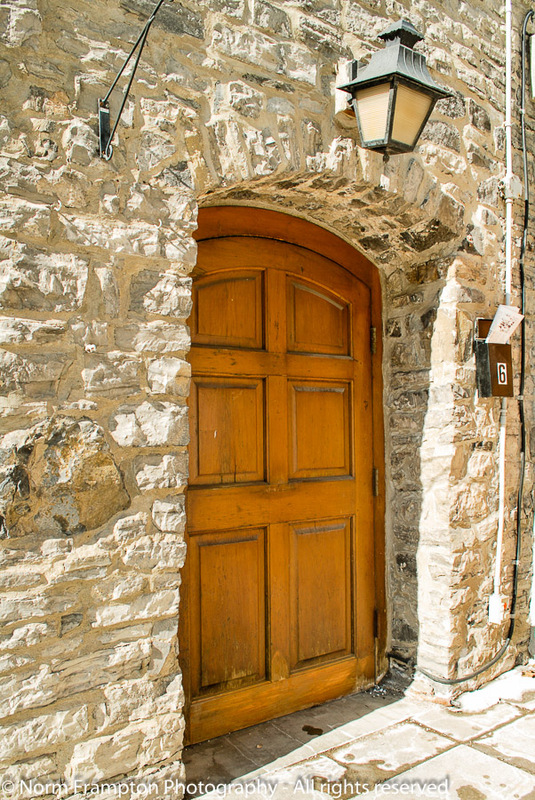 Beautiful collection of doors, and great series of images. I would love to walk and explore there. Now, here’s another place I wanna go — Quebec! Thanks for posting pics. I’ve got wanderlust all over again. This looks like such an interesting place to walk and explore Norm. 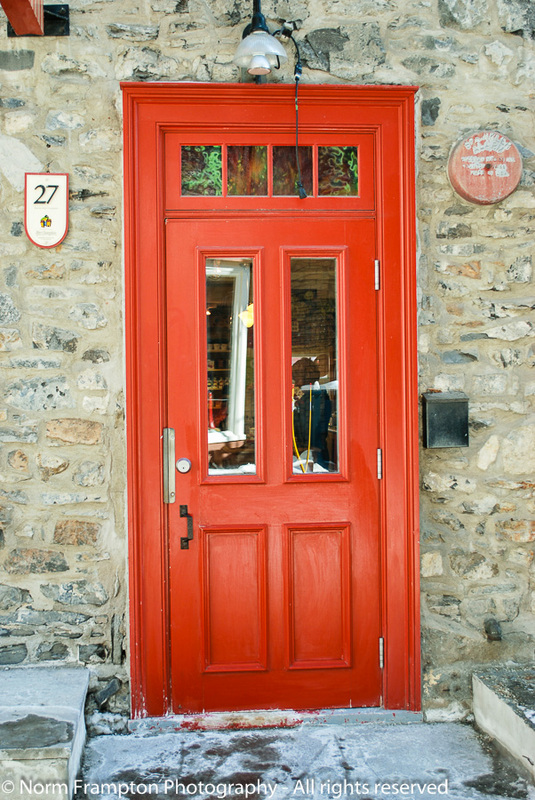 I love the colorful doors and shutters. These doors, so close to the street, braving the winter elements, are truly survivors. The Chateau looks majestic as it overlooks all of this. Great photos! Thanks Dan. We’re going to get around to actually spending a night at that hotel one of these days. It is such a beautiful building. Oh, what a fairy-tale! When I first saw your Chateau in a photo, I thought it must be a trick, a set-up, a film setting. And yet it’s real. And the doors are magnificent too. Thanks so much for the kind words. You can see the Chateau from just about every street corner at the bottom of the cliffs. It takes some getting used to because at first, each time you turn and look up, it takes your breath away.